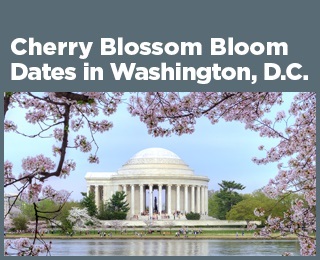 ﻿ Fun Easy English - Environment - Global warming - Climate change Indicators: Cherry Blossom Bloom Dates in Washington, D.C.
Home - Environment - Climate - Ecosystems - Indicators: Cherry Blossom Bloom Dates in Washington, D.C. The exact timing of peak bloom varies from year to year, and it is largely driven by local temperatures during the winter and early spring. As the Leaf and Bloom Dates indicator explains, scientists have very high confidence that recent warming trends in global climate are causing spring events such as leaf growth and flower blooms to happen earlier. In the case of Washington’s cherry blossoms, earlier bloom dates could affect tourism and the local economy. 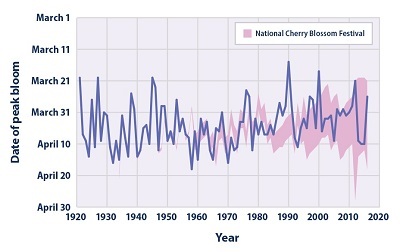 In addition to winter and early spring temperatures, the timing of the peak bloom for cherry trees can be affected by other weather, climate, and location factors. For example, extended growing periods and warmer autumns could affect bloom dates by altering other stages of cherry tree growth.